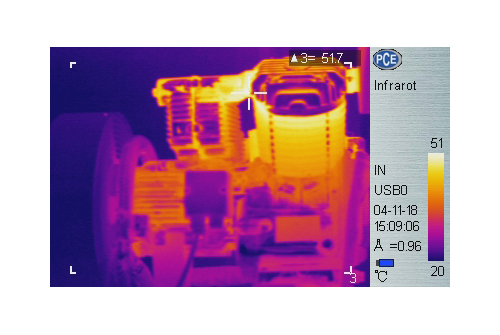 The lightweight Thermal Camera PCE-TC 9 (393g), with a sensitive infrared microbolometer (NETD < 65 mK) and an ergonomic design, is the ideal choice for professional thermographs. The Thermal Camera PCE-TC 9 convinces with an easy handling, high performance and acceptable acquisition costs. 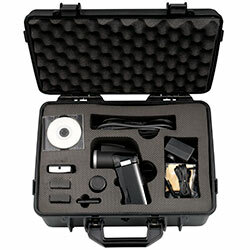 The integrated 3.0 megapixel camera simplifies documentation and reporting. The IR- and real-images are taken from a safe distance and can then be stored on the SD card in JPEG format. The included 2 GB memory card is capable for storing 5000 images taken by the Thermal Camera PCE-TC 9. Thereupon, these images can be analyzed with a PC by the also included software package. 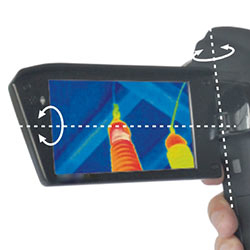 The 3.5-inch color LCD of the Thermal Camera can be rotated 270deg. The LCD of the Thermal Camera shows the min., max., and average temperature, 3 selectable measuring ranges (each with min., max. and average value) and 4 measuring points. 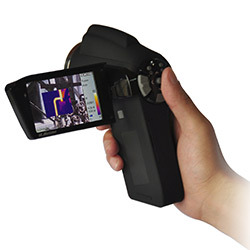 With these features, the Thermal Camera is suitable for performing significant thermography. Additional functions such as setting isotherms, or the point-, line-, and area-functions facilitate image analysis and increase the flexibility of the Thermal Camera PCE-TC 9. If you have questions about the Thermal Camera, see the technical data below or contact us. 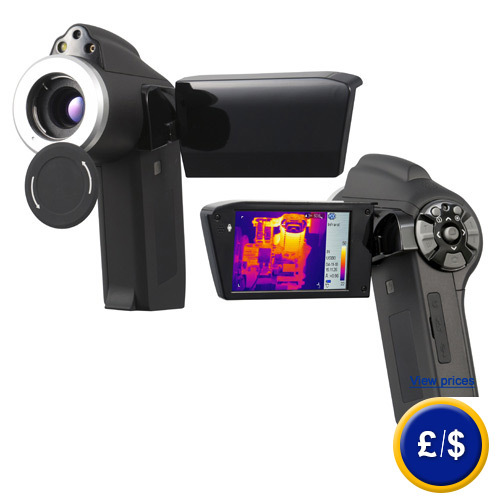 Our technicians and engineers will be happy to advise you on this Thermal Camera or any other product on the field of regulation and control or scales and balances of PCE Instruments. - 3 measuring ranges: min., max., and avg. 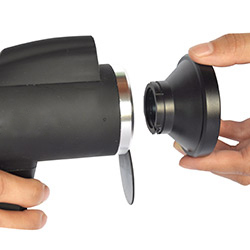 The foldable and 270deg rotatable display of the Thermal Camera is readable at any position. with a low weight of only 393 g and dimensions of 128 x 62 x 154 mm, the employment and the transport of the Thermal Camera PCE-TC 9 is very comfortable. thanks to a resolution of 384 x 288 pixel, a thermal sensitivity of 65 mK and an accuracy of ± 2 Kelvin, the Thermal Camera provides reliable data. The standard-lens 21°x16° / 0.4 m of the Thermal Camera is removable and can be replaced by the optional available lenses 38°x28° / 0.3 m and 11°x8.5° / 1.2 m.
The laser pointer of the Thermal Camera helps the user to locate the measuring object in low illuminated environments. 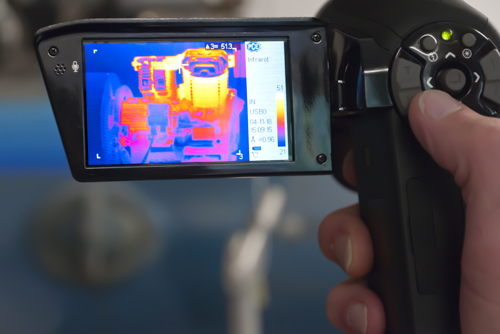 The 3.0 MP digital camera of the Thermal Camera provides high-resolution pictures, which can be used for reporting processes. 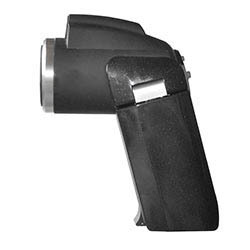 The motorized auto focus function allows the user to operate the Thermal Camera quickly and easily with one hand. Included in the delivery of the Thermal Camera PCE-TC 9, the free software allows the user a professional data analysis and provides the export of all data to MS Office Word. Thanks to the automatic hot spot /cold spot detection and the average temperature calculation, useful information for rapid fault detection are provided by the Thermal Camera. The picture in-picture and thermal fusion function of the Thermal Camera eases localization during measurements. Via USB, the IR-image of the Thermal Camera can be displayed in real-time on a PC. 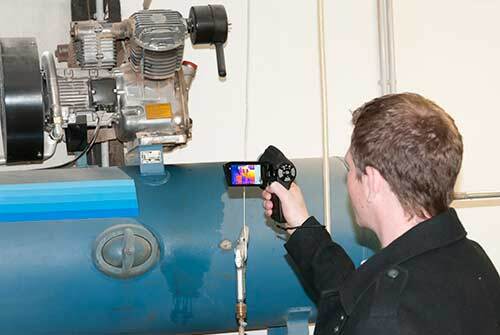 The intuitive user interface allows the operator to perform measurements quickly and precisely with the Thermal Camera. 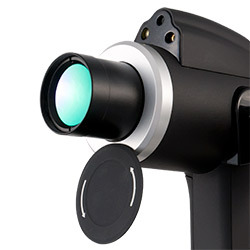 The built-in microphone of the Thermal Camera allows the user to add a voice memo to any image. 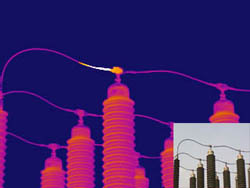 Below you can find more products of the category "Thermal Camera"
Hungarian , Turkish or Polish .